After a thorough examination and assessment of your teeth, gums and overall health, we may recommend gingival grafting. The tissue we use in this procedure may be obtained from a variety of sources: an area next to the area of recession, from the hard palate, or donated tissue from another person, which has been medically processed to make it safe to use. There are several different methods of grafting. For example, if you have lost gum tissue in an area of your mouth that's not highly visible when you talk or smile, we can place additional gum tissue there to prevent further recession without trying to cover the tooth-root surface completely. This procedure is referred to as a free gingival graft (you are separating the tissue from its blood supply) and it takes about 45 minutes to perform. It is very predictable with a very high success rate. 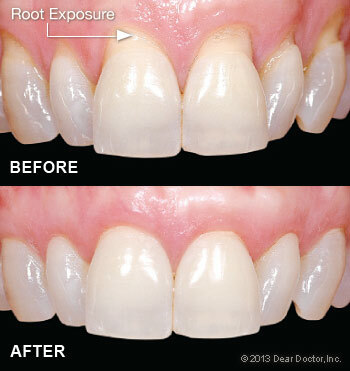 If your objective is to cover root surfaces, the procedure becomes more complicated and will take longer, but is still very successful.